This amazing harness is made out of fake leather. It is slightly adjustable under the bust and around the neck. It has small buckles on the sides to help but it on and adjusting the size. And in the back of the neck these is small lacing. I have few of these in size S in stock ready to be shipped out. Fits best when the circumference under the bust is 68-73 cm. Can also be made in bigger size. I decided to make new harness for me but since it looks so nice I decided to share it with you guys. I have only small amount left this leather strap left so I not able to make many of this but I'm trying to search more strap asap. Today I'll be at Ateljeekatu again if you want to visit while I'm there. Also I would like to hear what kind of posts you would like to read? Today's outfit, making of or/and current obsessions. Designer/Dressmaker, model. This is my personal blog which will feature my research as well as some tips and insights into my work. 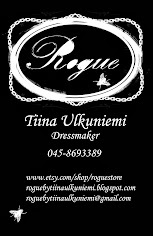 I'm also selling some Rogue samples on this blog. Etsy products, fleamarket and closet cleaning. More of the crossed bones print.